Keeping baby safe in your own home can be a difficult task. Babies discover the world by unloading shelves, pulling on cords, chewing on plants, and pushing over chairs but a good, sturdy play yard can offer caregivers peace of mind. A baby play yard creates boundaries and allows parents to complete tasks without being concerned that their baby will get into a dangerous situation. There are good play yards available that keep babies safe while offering a variety of attractive features such as color choices, one hand access gates, portability, and easy cleaning. The NSSC provides the safety that you want and need in a play yard while also providing a large play area for your baby. The NSSC comes in a 6 or 8 panel pack. The 6 panel pack can be extended with a 2 panel expansion pack. The 8 panel configuration is large enough to accommodate a baby and adult comfortably. The more panels you use, the more creativity you can have in configuration. This maybe critical when dealing with difficult floor plans or problem areas that a baby should not enter. Having such a large area for play creates options not found in other play yards. Toy stations can be set up in each corner and the large square footage allows room for a bassinet, if having baby take a nap in their play area is important. It can securely handle more than one child, a nice feature for multiples, play groups, or play dates. The NSSC is free standing when fully assembled. To assist in assembly there is a clicking sound when panels are correctly locked together. The angle of the panels is important and it is not recommended to use more than 8 panels as doing so changes the angles enough to decrease stability. North States tests for toxins and lead in all of their products and meets United States standards for lead, VOCs, PVCs, and other heavy metals per stated on their website. This is an important concern as babies frequently bite, chew, or lick their baby gear. Another safety issue with baby play yards is the baby’s ability to push the play yard over or slide it across the floor. The NSSC does come with non-slip pads that not only help prevent it from sliding across the floor but can also protect hardwood floors or other easily scratched flooring surfaces. However, users did state that the pads did not prevent it from sliding on all carpet. Some users needed to anchor the play yard or put foam mats under it to prevent sliding. The design of the cutouts in each panel prevents a baby from climbing it like a ladder. Yet, they are big enough for babies to get a grip and pull themselves up without tipping the play yard over. Many users also liked that additional toys could be clipped to the panels. Aesthetically, this play yard’s bright panel colors appeal to a baby. The non-toxic plastic used in the NSSC cleans well, a necessity for equipment that will be used outside as well as inside. The longevity of the product will be lengthened if it can be properly cleaned and maintained. Babies can explore outside and enjoy the outdoors while parents can do yard work and get some fresh air. Outdoor use can also benefit families that do not have a fenced yard as younger children can play outdoors with the rest of the family. To prevent ware from excessive weather do not leave the NSSC outside all the time. Being able to keep your baby with you continually and in different locations in the house is an important issue. Weighing in at 26 lbs., the NSSC can be carried using the provided handles when the play yard is properly collapsed. Be sure to check the manual that comes with the product because the panels do have to be folded in the correct direction to prevent damage. This play yard does not come with an access gate but the 26 in. height of the panels is suitable for adults, even petite ones, to step over the panels. North States has a good comprehensive website where you can register your product, order replacement parts, and download product manuals if lost. 6 removable and adjustable panels, each measuring 32 in. by 26 in. 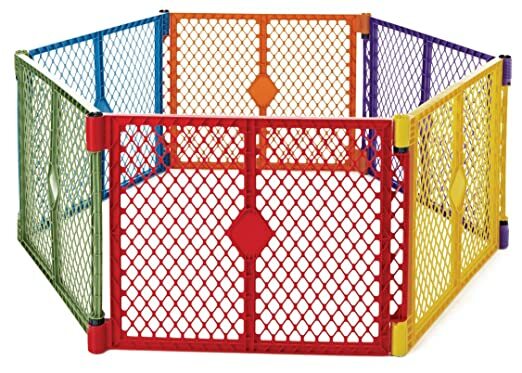 This play yard has the features you need for a reliable way to protect your child and help you get your work done. Safety always has to be the first concern with baby products and the UPY does not disappoint. There are no crossbars, or ladder like openings for baby to climb. The cutout design does allow for little fingers to grip enough to pull themselves up without tipping the play yard over. The panels when configured as directed by the manufacturer are stable enough to prevent the gates from tipping over. The UPY comes in a 6 panel pack, with an optional 2 panel expansion pack. Using the expansion panels increases the square footage from 18. 5 to 34 square feet, a significant difference especially if you want to use the play yard outside or in a large open floor plan. The angles of the gates are most stable in the 8 panel configuration. Ordering more than the recommended 8 panels could compromise the stability and safety of the play yard. 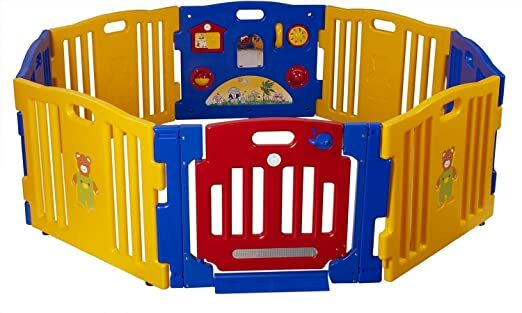 The UPY includes pads that can be attached to the bottom of the panels to prevent babies from pushing the play yard across the floor, a nice safety feature and protection for hardwood or other easily scratched flooring surfaces. However, users did report that the play yard could still be pushed on carpet even with the pads. Consequently, many users opted to place foam pads under the panels while using on carpet. North States does test for all known toxins and meets or exceeds all requirements in the United States. The plastic used is safe for a baby to chew, lick, or bite without exposure to toxins and the plastic is soft enough not to damage baby gums. Portability and weight are also important considerations for a play yard. The UPY can be folded down and moved using the handles provided. When panels are properly assembled there should be a clicking sound that indicates the panels are properly locked in place. Six panels weigh in at 21.5 lbs. making it a doable weight for most adults. However, the UPY might not be the right choice if you are looking for something that will be moved on a daily basis as some users have found collapsing it to be challenging. 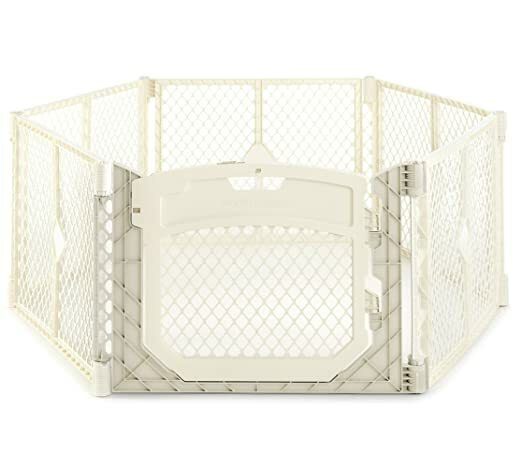 The UPY comes with a one hand access gate, a convenient feature for parents juggling snacks, toys, and baby. While the gate provides easy access, many users still reported that they preferred to step over. With the panel height at 26 in. it allows adults, even petite ones, the choice of safely stepping over the panels. The UPY comes in several colors, neutral ivory being a favorite as it can blend in with many color schemes in the home. Again, the North States website offers product registration, replacement parts, and accessories. While the ProSource has slightly smaller square footage than some other models, it has features that make it a stand out pick, such as an activity panel. The activities provided on the panel are repeatedly reported as a favorite feature of babies and parents alike. The activity panel successfully keeps babies engaged after they have lost interest in their own toys. The panels are soundly constructed to prevent them from being knocked down. Suction cups on the base of the panels prevent it from sliding on hardwood floors. Users reported that these cups worked well except on carpeting. Many used foam pads to keep the ProSource in place on carpets. The cut outs on the panels are slits so they cannot be climbed or used to pull up on. Babies are going to have a hard time climbing out of this model. The hinged door provides easy access for parents and the safety lock ensures that a baby is not going to inadvertently exit. One hand use is not advertised but if you do not want to try to step over the panels the door works well. If you do end up stepping over the panels, they are only 24 in. high making a low clearance height for petite adults. The hinge design allows for creative configurations. Most users preferred either a square or hexagonal configuration but because the hinges do not click or lock in place the angle of the panels is not important to the stability of the play yard. This allows for greater flexibility in shape of the play yard, a nice feature for difficult floor plans. The size of the play yard can easily be adjusted by adding or removing a panel. The ProSource is not meant to be a portable play yard. It has thicker construction that makes the panels heavier than comparable models. The added thickness makes for a sturdy play yard that is not easily toppled over. If you are looking for a strong, sturdy model that will stay put for the duration of its use the ProSource is a good choice. This play yard is not advertised for the outdoors. The company does not have a website separate from commercial seller sites. Some users complained that the manufacturer was difficult to work with when they had a problem with the play yard. Another common complaint was the stickers provided for the activity panel peeled off and babies chewed on them. Many users opted not to put the stickers on at all. The Pop’n Play provides portability at a good price. Set up is quick and easy as it pops out fully assembled, a nice feature for traveling or visiting friends and family. This is the right play yard for an active family on the go with baby. It can take the stress out of a long trip and give baby a safe place to play and sleep that will be familiar. It may not provide some of the stability of other baby play yards but it makes up for it in the ease of assembly and flexibility of uses. 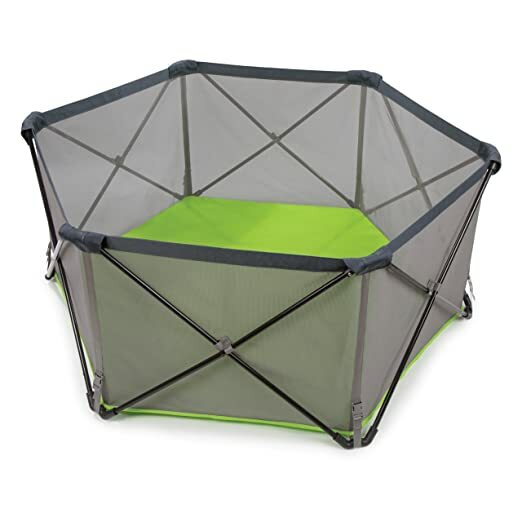 Weighing in at only 12.2 pounds, the Pop’n Play can easily be stowed in the trunk for a trip to the beach, picnic in the park, or in the backyard. It is meant to be used inside or out. The construction uses a water resistant canvas floor that will keep a baby dry on grass or protect them from sand. The mesh siding is not as easy to keep clean as the plastic panels of other models but it does require only a damp cloth for cleaning. The canvas floor also provides additional safety in that when used indoors, because it is attached to the sides, the play yard cannot be pushed or scooted across the floor. On the down side, the Pop’n Play cannot be expanded to provide more play space. The Summer Infant website provides excellent information on maintaining their products, overall baby care, and product registry information. There are also accessories that can be added like a sun shade that can allow for the Pop’n Play to be customized for the needs of the user. The lightweight construction may not be ideal for someone looking to use it every day for long periods of time but if you want something that will work when you have to have your baby contained the Pop’n Play is a good choice. We all want our children to be safe. A play yard is meant to provide a safe place for a baby to play so parents can accomplish other tasks or simply relax knowing the baby is not in danger. Consequently, safety becomes important on two levels. It has to keep the baby safe, while also being safe for the baby. First, a play yard should be strong and stable enough to withstand a small child tugging, pulling, chewing, and throwing objects at it. The play yard should not topple over easily. Babies test limits and a play yard that is going to keep a baby safe is going to withstand the limits of a baby. Second, the materials and construction used should be safe for the baby. There should not be any parts or attachments that can be removed or swallowed by a baby. If possible look up the materials used in construction. Ideally the play yard would be BPA free, PVC free, and lead free. Most manufacturers are willing offer up this information because it is of such high concern for consumers. Babies are hard on equipment, especially equipment meant to keep them contained. A play yard should be made of durable materials that are easily cleaned, especially if it is meant to be used in and out of doors. The materials need to be able to withstand moisture and dirt. Not only can baby saliva get all over it, but if it is outside moisture may seep up from the ground. If the play yard is to last as long as the baby needs it, it must be able to withstand the rigors of the environment it will be used in. Some play yards advertise being moisture resistant. If you are going to be using your play yard outdoors make sure to look for this feature. Also, check the recommended age for the play yard. There are some that are meant for children 3 and under while others are only recommended for 24 months and under. If you potentially want to use the play yard for longer, a model meant for older ages would be a good investment. Many play yards are designed to be stepped over. If this is the kind of play yard you are considering be mindful of the panel height. This becomes particularly important for petite adults. Panel heights can range anywhere from 24 in. to 30 in. Panels in the 24-26 in. range are going to be a better alternative if no access gate comes with the play yard. If you are looking for a play yard with a gate, one handed entry is an important consideration. Parents who are frequently carrying children, toys, or other objects may need to open a gate with one hand. This can take the need out of stepping over a panel, preventing any kind of fall. Deciding how you want to use your play yard will help determine how important portability will be to you. Many play yards can be used outside just as easily as inside. In the warmer seasons having a safe place for a baby to play outside becomes invaluable particularly if you do not have a fenced yard. Because of this, ease of portability is an important feature to consider. Does the play yard take 30 minutes to put together? In that amount time what has the baby already gotten into? It should be easy to put up and take down by a single adult within a short time frame. Lightweight, portable designs frequently come with easy to use handles that help move the play yard. Check the weight and the width when folded down if portability is feature that you want. The popularity of open floor plans leaves more play space for a baby. Play yards that encompass a larger square footage will work better for these homes. If you think you may want to expand your play yard in the future look for a model that can easily add extra panels. Some play yards loose stability if you add more panels than recommended. Others can be configured in such a way to allow for more expansion. A play yard is a good solution for many busy parents. Like all baby gear it is important to decide what features are important to you. How do you want to use the play yard? For example, if it is going to be set up in the living room and not moved until baby outgrows it, then a heavier model would be a good choice. However, if the play yard is needed for vacations, family visits, and outside you may need a lighter weight, more portable model. Decide which features and options are important to you and know that safe, quality play yards are available to make life with baby easier.